Get up close and personal with six magnificent elephants on the banks of the Sabie River. The Elephant Whispers experience allows you to touch, exchange trunk greetings and offer tasty treats to tame and trained elephants varying in ages from nine to twenty six years. Visitors can also enjoy a thrilling elephant ride meandering down shady paths and enjoying the view. 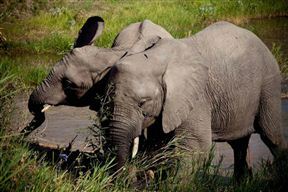 Several excursions are available – view http://elephantwhispers.co.za for more details. From Hazyview, take the R40 towards Hoedspruit. Look for the Elephant Whispers sign on the left-hand side. Elephant Whispers is 2.2km from the centre of Hazyview , the nearest airport 39.3km (Kruger Mpumalanga International Airport).